I’m always challenging myself and working toward taking my art to the next level. This particular test was to paint realistic water droplets. 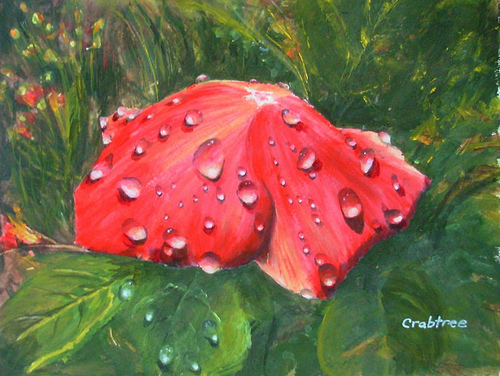 The flower from the reference was white, but wanting to make a bolder statement, I decided to paint my flower red. The background was improvised to make Ms. Lizzie pop. In my mind’s eye, this beautiful bloom is tucked in a dewy forest somewhere, admired only by the creatures of the forest until this painting was born. 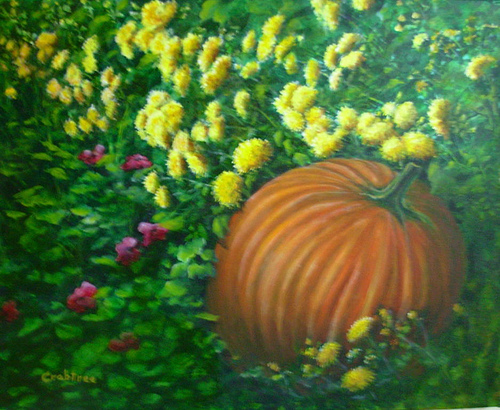 This painting tends toward "Shabby Chic" which is a style that I adore! 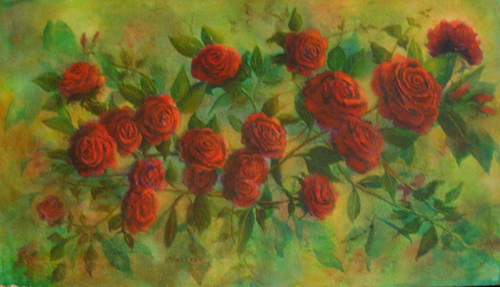 It was my intention to keep the background loose and spontaneous and define the roses - the stars of the show - to bring them forward. To complete, I chose a white distressed frame (not shown). I was quite pleased with the results! Watercolor and ink painting on 9" x 12" paper. 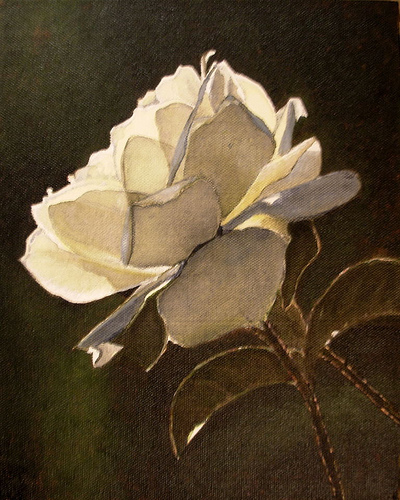 This was an experimental piece where I used plastic wrap to initially form the leaf patterns in the background after applying Frisket to the flowers to be painted last. Not my usual style as it tends toward abstract, but I was fairly pleased with the results. This painting was given to a friend as a birthday gift. 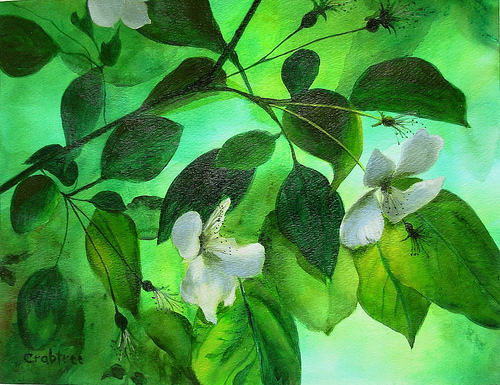 This painting began as a study in greens but ended up being a study in both greens and whites. 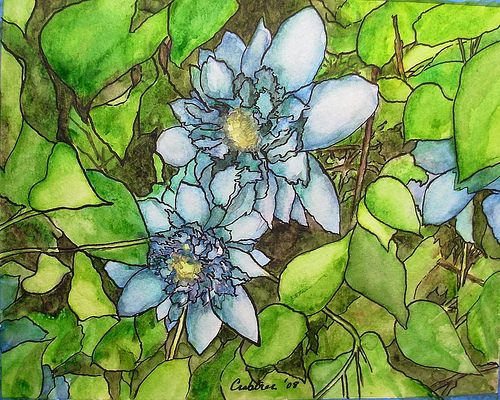 My secondary goal was to render the effects of back-lit leaves…strong contrasts, bright sunlight and deep shadows. 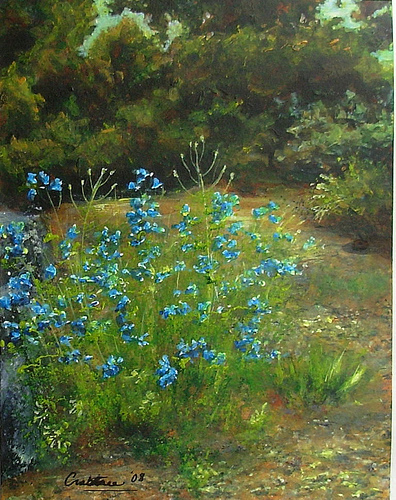 Most times I struggle to title my paintings, but upon finishing this one, and then glancing at it as it rested on my easel, the white flowers seemed to whisper to me – and a title was born. 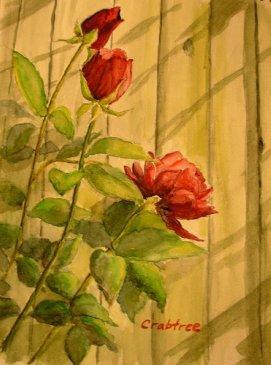 Pictured here is one of my first watercolor paintings,and still one of my favorites!